"If it isn't broken, don't fix it!" Here at Bertie County Peanuts we live by this adage everday. Still, our younger farmers around here keep asking for us to "kick up" some of our recipes. This blend of our Blister Fried Peanuts and spicy sesame sticks provides a great "crunch" and an explosion of flavor that has folks coming back for more. I think these are mighty good! The salt and pepper nuts are fabulous and the goobers are also delicious. Came to home really quick after ordering online. During the summer and fall, I was on a high protein, low fat diet, eating six small meals daily. I could not eat six servings of meat or fish daily so I substituted peanut butter and peanuts for two meals. A glass of vegetable juice, a cucumber, and a small serving of Goobers and Kickin' Stix made a delicious meal almost every day. And I lost 50 pounds. Goobers & Kickin' Stix are always a favorite in my house. The kids love them! We had bought a small container from a school fund raiser. They didn't last long. Had to order a big one! While we are big fans of your raw jumbo peanuts, the Goobers & Kickin Stix are much too salty for our liking.After reviewing the ingredients of the stix we won't be purchasing them again. Great snack. Only ordered the smaller size to try them out. Now I'm going to have to order more! there great but way to salty!!!! Fantastic! The combination of spicy sticks and goobers is wonderful. I like it spicy and these all fill the bill perfectly! Will definitely purchase again. A family favorite and the go to for our 3 year old daughter. 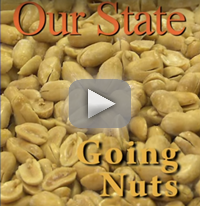 Bertie County Peanuts a Great! 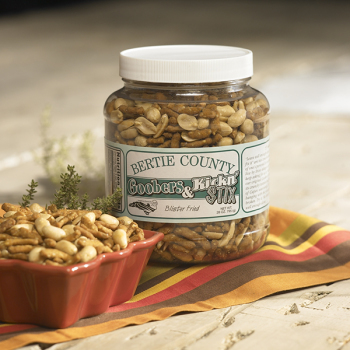 We love Bertie County Peanuts...especially the Goobers and Kickin Stixs and the Batchelor Bay Seasoned peanuts. Fast shippers too! First ordered a small jar of these and thought they were the best. So next order was for multiple large containers! A delicious product. Kickin stix are great but peanuts a bit bland and chewy. I picked peanuts out and ate the stix. A better combo would be stix with blister fried peanuts. We sent these peanuts to a client and they are thrilled with them. They have been raving about them and said the 28 oz jar is a big hit in their office. Love this combination of fresh peanuts and sesame sticks. Love to take this product to family gatherings. Whenever I see these, I buy them. There are my favorites. Tastes really good, but saltiness is overwhelming. Time to improve its potential. Loved the Kickn' Goobers&Stix!!! Great spice. Loved the most that my purchase helped the hurricane victims. Love the Peanut/spicy sesame sticks mix! 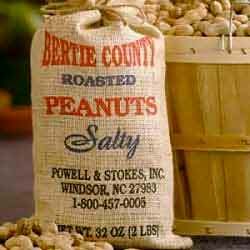 and new products from Bertie County Peanuts! Learn more about us in this video from UNC TV.